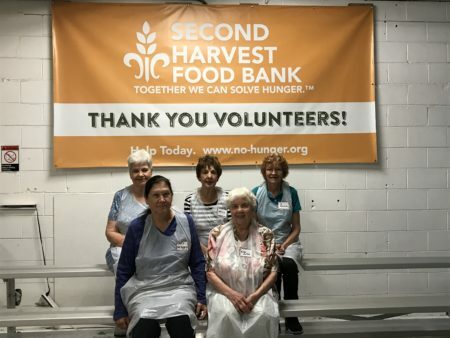 On an early morning in July, five of us met at Second Harvest Food Bank in Hanrahan, Louisiana. Associates Nancy Pumillia, Catherine Guirovich, Patti Hebert, and SLW Julia Stump and Marilita Roy committed themselves to volunteer to help in the kitchen area that morning. Another group of young volunteers from Chef Emeril Lagasse Foundation joined us. 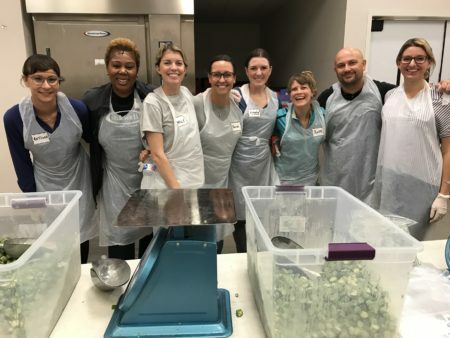 They volunteer once a month for a food–related nonprofit and otherwise they work in the office in New Orleans. They were delightful to work with and were very interested in all of us. The first thing we did was to work in an assembly line to fill lunch boxes for children at summer camps. Things went smoothly as each person had one item to put in the boxes. The lunches were very healthy. After that project was finished, we worked in another section of the kitchen with fresh okra. Southerners use it a lot in homemade gumbo. It can also be fried. The okra was frozen in a huge cardboard box. One volunteer was needed to first break up the frozen okra. Patti Hebert, ASLW, one of the oldest persons there volunteered to do so but she proved to be the strongest! The okra was then put into plastic bags and weighed to equal five pounds. It was then sent down the assembly line to be flattened out and five bags were put in a cardboard box to be shipped to nearby food banks. We, the SLW group and the Chef Emeril Lagasse Foundation group were so efficient that we finished our work ahead of our scheduled time! We enjoyed working and being together for a great cause. Everything works so well there because they have a hired volunteer coordinator and an online volunteer site. We scheduled ours last month for July since June was filled already! Many young people come there for service hours. Plus retired people and business groups come to volunteer in a morning or afternoon slot. We all had a great time working for a great cause; to feed the hungry!